Mr. Dana Lowe, Rockvale native and historian, tells some interesting and often humorous stories about the community. 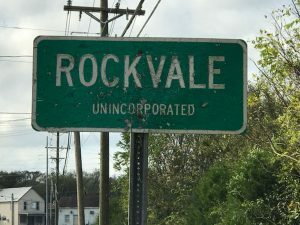 We will share a tidbit of Rockvale trivia in each issue. Issue Three’s featured fact is about a principal of Rockvale School, Mr. William Eris Read. Dana shares this short anecdote: From the early 1950s to the early 1970s, the Principal of Rockvale School – grades 1 through 12 – was Mr. William Eris Read. A local fellow made good, Mr. Read was himself an alum of the school he administered. On his desk was a neat little nameplate with chrome letters saying simply W. E. READ . As a kid, I thought, “How appropriate. At our school, the principal’s name says, ‘We Read!’ ” Rockvale has always been kinda literate, like that.